1. First you will need to start with a good side profile of the person. Make sure there is some contrast with the background so you can get the details of their profile and catch some detail in their hair. Print out the photo in the desired size you would like the end silhouette to be. 2. Next, placing your tracing paper over the photo, carefully trace around the profile of your person. It’s good to incorporate any cowlicks or wisps of hair in bangs or ponytails. These little details make the silhouette more unique and interesting. Don’t worry, sometimes it takes a couple rounds of tracing the face to get just the right one. 3. When you are happy with your tracing, staple the tracing paper to you black acid-free paper. Staple around the traced silhouette. This keeps it in place as you cut your silhouette out. 4. 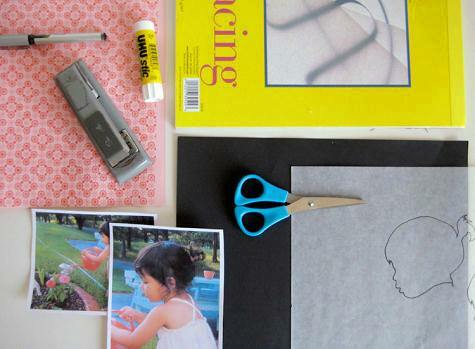 Carefully and slowly cut your silhouette out, using either a good pair of scissors or an Xacto knife (whichever you are more comfortable with using). The tracing paper should be stapled securely to your black acid free paper, but just make sure you are cutting through both as you go. 5. 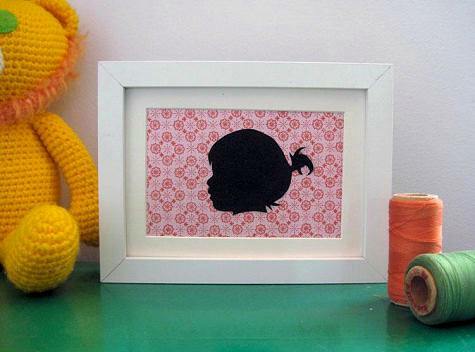 Then take your finished black paper silhouette and mount it to the paper of your choice. I used a patterned paper but you can mount it on plain white background or even use a fun floating frame like shown in the photo above. Use glue stick or spray mount to secure your silhouette. 6. Place in your frame of choice and enjoy! These make great gifts and are a great personal memento for any home. That is such a fantastic idea, and would make a really awesome Mothers’ Day present! Great post! So cute! Funny that you mentioned your cats. I made similar silhouette portraits of my lab and corgi. I remember making these as a part of an art class in elementary school (circa 1978). I know a few ladies for whom this would be a perfect Mother’s Day gift for. Thanks! Yes! Thank you so much for sharing this. Those silhouettes on the staircase were one of the first things I noticed in the sneek peek. I just love the way it looks with the three all lined up in that one frame. I am definitely trying this one out. What a cute idea! I loved it so much that I wrote about it on my blog today! Have you seen the photo in Jonathan Adler’s book or on his website with his, his dog’s, and his partner Simon’s silhouettes? I love them! Thanks for the great idea. Thanks so much for these instructions – which seem easy enough for someone like me – a better admirer than creator of art. I can’t wait to make them for gifts! I am so glad you posted about this Grace. I always love silhouettes, however they are always black and white! I love adding the color in the background. So cute! I think maybe I’ll try one of my friend’s pregnant silhouette- great for an expectant mom’s Mother’s Day. Love it! I especially like how it looks on the printed background. I saw this amazing poster print and few cards as well..they’re gorgeous and great for kids. thought you might be interested. this is sooo cute. it instantly reminded me of when i was a small girl and i had a necklace with a silhouette of a boy and a girl with a pony tail just like this. memories…. i made one of these too, when i was in elementary school (circa 1998) only we put cut outs of our favorite things in our heads… not very stylish (although i will admit i still have mine, laminated and all, and also a bit incomplete). But i love this idea more, and will probably make one of me and my fiance. how magnificent! My son painted a wooden jewelry box for my mom’s birthday. I was going to glue a photo or some beads to the top of the box for decoration. Now I’m going to make a silhouette of my son and glue it to the box. Great idea-thank you! Just what I was looking for! I have a church group of 8 to 12 year-0ld girls and we are having a Mother/Daughter tea party. We needed a great Mother’s Day Gift that the girls could make and THIS IS IT! Thanx! I tried this project, but did it w/ a twist. I did a one using a young Audrey Hepburn’s profile and one of my dog! SO COOL looking, thanks for DIY…LOVE THIS SECTION!! I did these this week – one of my son and one of my boyfriend’s daughter. They were so easy – it took about 25 minutes each at most. I have started smaller ones for mother’s day gifts and found them more difficult and having to re-cut to get the profiles just right. my ‘what am i going to make for mother’s day’ question has been answered… thanks!!! Fathers Day 2008! The perfect gift for the man that loves his kids and hates it when I spend money! I am thrilled with how they turned out! I LOVE this! I can remember sitting in my preschool class getting this done. Thanks so much for posting this! I have been wondering how to do this and this is a great tutorial! Thanks! What a wonderful project! Thanks for sharing. I will have to try this. I like to make silhouettes for MD gifts. However, I have to use actual shadows and would like a way of making them smaller. Any ideas welcome. I just found this article in Real Simple, May 2009. I have always loved silhouettes since my first one was made when I was in Kindergarten. I still have it 49 years later. I would like to share two ideas. I am a 30 year first grade teacher. My favorite mother’s day gift is a silhoutte project I help my first graders make. I take each of the kids pictures with an instant polaroid camera. The child’s face is on one side of the picture and the back of the instant picture is naturally black. I use a small pair of cuticle scissors to cut around the face. When you’re done cutting, turn the picture over and miraculously you have an instant silhouette to use as you like. The second idea I’ve used for silhouettes is when celebrating the President’s during the month of February, you always see Washington and Lincoln in black silhouette. My whole school made life size head silhouettes of every student in our school and hung them over their locker. It looked so cool. We had fun guessing who was who and had them hanging during conferences when parents were there. It was one awesome sight! so cute! im going to make this for my mother for xmas! I did these for mothers day last year for grandma’s. The only differance is that I just cut out the photo and then i let my son paint black over top of it… he felt special getting to help make a big portion of it. He was also was just learning to write his name, so I let him write it below the silh on the white to make a really cool affect. I saw the link for this site at Rock’s in my Dryer… and so now this is my project for the weekend! Thanks so much for all the detailed instructions! Thank you so much for this tutorial, I used it to make Mother’s Day gifts and linked to you!